Your hands are your body’s first connection with your dirt bike, through your grips. Your dirt bike grips should give you protection from vibration, prevent arm pump, and give you good feel and control of your bike even when riding in wet and muddy conditions. Luckily dirt bike grips aren’t expensive, so you can experiment to find what suits you best. 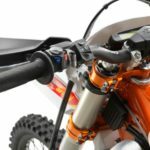 There are just a few things to keep in mind when looking for the best dirt bike grips to suit you. Comfort and Feel: If you are using the right grips you shouldn’t even be conscious of your grips. If you are getting blisters and arm pump after even short rides, you know you’ve got the wrong grips. The type of riding you do will have a lot to do with the type of grips you should be using. Durability: You want your grips to last more than a couple of weekends, whether they are a soft or hard compound. It’s best to go with name brand grips, they’re a pretty cheap item when compared to other parts on your bike. 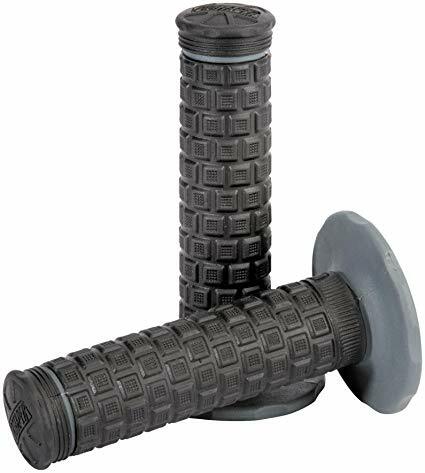 Value for money: With the difference in price between a quality grip that you’re comfortable with, and an inferior grip being only a few bucks, it’s better to go with the one you’re most comfortable with. Typically, grips with a soft compound will wear out quicker, and a harder compound will last longer. If you like a softer grip, you can afford to replace them a couple of times a year. There are three different compounds available for dirt bike grips, plus a mixture of the three. It’s largely a matter of personal preference. There are pros and cons for each. Try different compounds out and over time you will get a feel for which suits you best. If you’re not sure, first try the medium compound, and from there decide whether you want to go harder or softer. These are a combination of the three, with the harder compound on the higher wearing areas. Soft on the outside surface for your hands, Harder density on the tip. Soft on the outside surface for your hands, medium density on the donut. Third Waffle: waffle pattern only one-third of the way around. Good for riders with smaller hands. It’s important to get the orientation that is comfortable for you when installing them. The Diamond Pattern is the smoothest of the designs, and they do feel the thinnest of all the designs, so it’s a good option if you have small hands. They’re a favorite for a lot of riders who like the feel and control they give you. Lots of Trials riders use them. The Downside: Not so good grip when it gets wet and muddy. The Pillow Pattern is designed for riders looking to reduce vibration. If you suffer from arm pump, these may be worth a try. 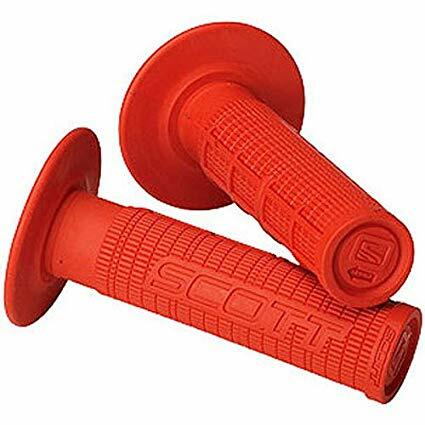 The Scott Sports Radial Half Waffle Grips are an old favorite that has been around for years and are still preferred by a lot of riders today. The half waffle design gives your fingers some additional grip on the waffles, while your palms rest on the smooth surface. The safety wire channels in this grip make it popular with MX racers who like to safety wire their grips. 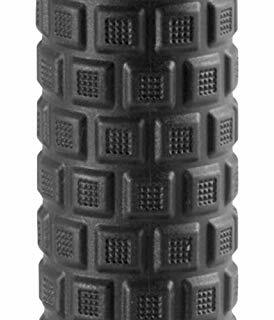 While this grip is labeled as a soft compound, some would consider it to be closer to a medium compound grip. The Scott Sports Radial also comes in the Full Waffle version. The Renthal Kevlar grips are quite possibly the most advanced grip available. 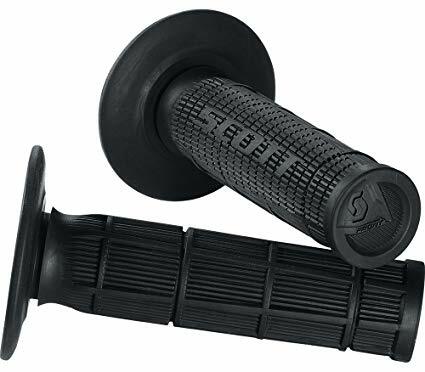 They offer the best of both worlds, the feel of a soft grip with the durability of a hard compound grip. This is achieved through the use of Kevlar. 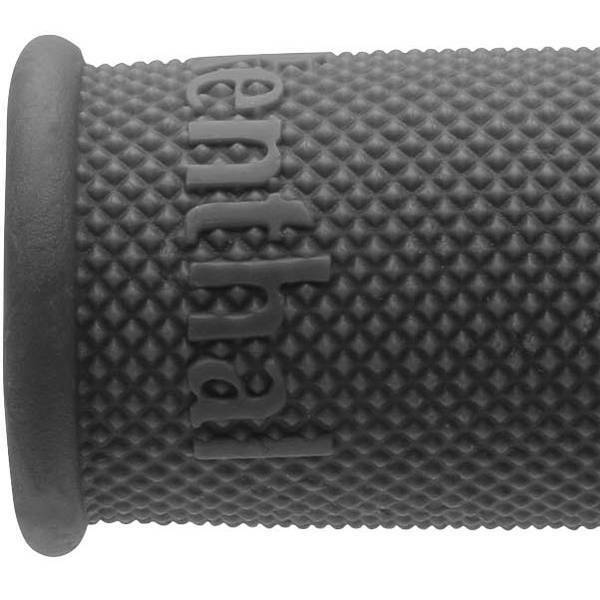 Kevlar is well known to be a very durable material, so Renthal has utilized it in the grip compound. It gives the grip good durability but also has a soft feel to it. The base material contains millions of Kevlar fibers. As the grip wears the Kevlar fibers make their way to the surface, so it gets grippier with use. It is a half waffle design with the waffle pattern to half the grip, and the elevated diamond pattern to the other half. On the tapered version (pictured above), the elevated diamond pattern reduces in size and tapers down towards the tip. It is a matter of personal preference, some riders use both. 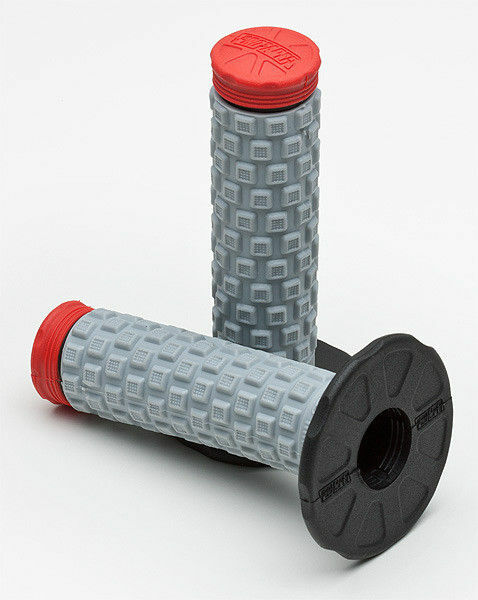 The Pro Taper Pillow Top grips would have to be the best dirt bike grips for vibration. If you suffer from arm pump, these would be the best on the market for reducing vibration. They are made from ‘Vibrasonix’ pillow which is specifically designed for absorbing vibration and cushioning against impact. The gel-like surface compound means that even in wet conditions, you still have a good grip on your bike. In muddy conditions, the pillow pattern is designed to self-clean, and shed mud away from the outer surface. They are a triple density grip. The outside is a soft compound, the donut is the medium density, and the tip is the hard compound. A great feature is the ANTI-rip Tip which increases the life of your grips. The tip is the most vulnerable part of the grip if you drop the bike, so it makes sense to make this a harder compound. 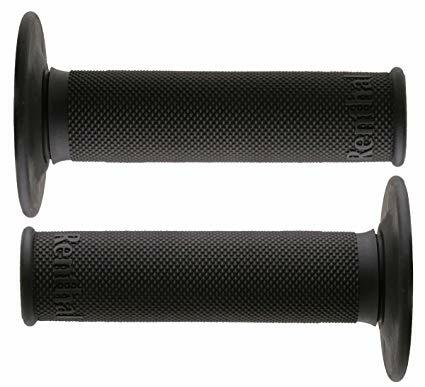 If you are prone to arm pump, these are the ideal grips for you but be aware they are a larger diameter, so suit riders with larger hands. If you have small hands, the Pillow Top Lite (below) may be more suitable. They also have safety wiring channels for those who like to wire their grips on. The Pillow Top Lites are the same grip as the Pillow Top version above, but they just have a lower profile design. This means that the little nodes (pillows) are slightly shallower giving an easier grip on the handlebars. This is ideal for riders with smaller hands because the grip diameter is smaller. The lower profile doesn’t reduce the vibration resistance and cushioning by much, so they still have all the advantages of the self-cleaning effect in the muddy conditions and excellent grip in the wet conditions. Renthal grips have been developed and tested with assistance from top factory racing teams from Europe and the USA. The Renthal Full Diamond Grips are a classic grip that has been a firm favorite for years among riders who like a thin grip. 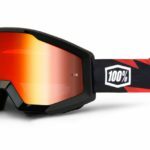 They are popular with trials riders who prefer the thinner diameter for more precise control. The thin grip gives you a lot of feedback through the handlebars and gives you a better understanding of how to control your bike. These are also a popular choice if you have small hands. You can choose between firm, medium and soft compound so you can match them to your riding style and personal preference. The Scott Sports Diamond Grip is a new grip design derived from the classic waffle grip. It is a triple density grip with the crisscrossed raised diamond pattern being the soft compound, and the base material being the medium compound covered with the regular diamond pattern. The firmer density is in the core and end cap, where you need it when you drop the bike. Black/white, Blue/White, Gray/Black, Green/Black, and Red/White. The design is very loud and so riders will either love them or hate them. One drawback with them is safety wiring. There is one safety wire channel near the flange, but none at the outer end, so if you like to wire your grips, it can be a bit awkward, but still be done. With Lock-on dirt bike grips, you will never have to worry about grip glue or safety wiring the grips again. The big advantage in lock-on grips is how easy it is to install and remove the grips, it can be done in a few minutes. If you don’t like gluing your grips and having to wait for the glue to dry, and then when you remove the grips having to cut them off and clean the bars, then lock on grips may be for you. Lock-on grips are slightly more expensive, but you are getting the throttle tube, and have the convenience of being able to change grips and effortlessly. 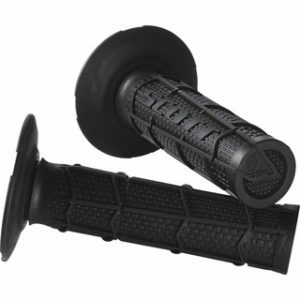 The ODI Rogue grips are very popular with ATV riders. They have the screw fixing on both ends of the grip and come with a new throttle tube also. The large raised pad design almost looks like a car tire, and is great for vibration reduction, but does mean that they suit riders with larger hands. 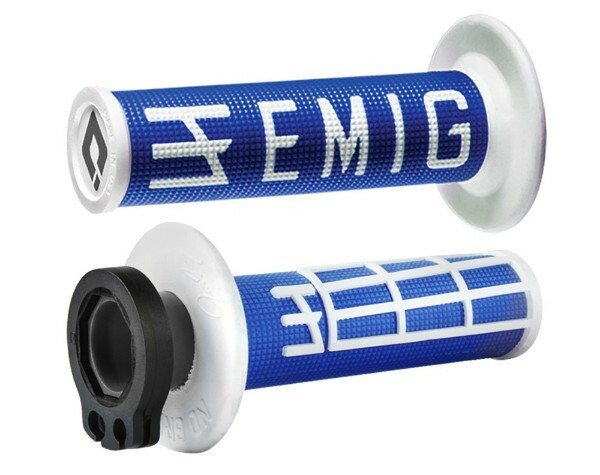 The OFD EMIG V2 grips were developed in a collaboration with multi-time AMA Champion Jeff Emig. Jeff wanted to develop the best grip for MX racers and saw the benefits of ODI’s new Lock-on technology and added his own custom design to the V2 grips. The great thing about these grips is they come with the throttle side grip already attached to a fresh throttle tube and cam. This means you can keep your existing tube as spare. Installation: Both the four-stroke and two-stroke grip kits come with a choice of two different sized Cams that lock onto the throttle tube. It is simply a matter of looking at the application chart and selecting the right Cam for your bike and locking it into place on the new throttle tube provided. From there you remove your old throttle tube and hook your throttle cables to the Cam on the new ODI tube and adjust the throttle play to suit your liking. Replacing your grips can be done in a few minutes – no glue or safety wire needed. Here’s a great grip for KTM riders. These are KTM Genuine grips which will fit handlebars 7/8″ 22-28mm in diameter. 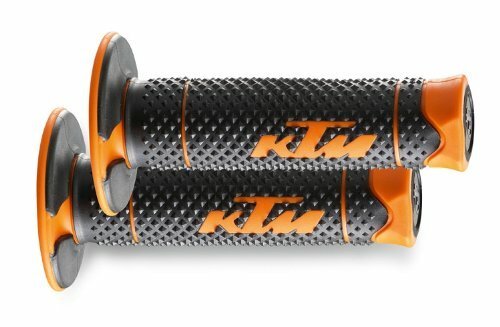 As a KTM rider myself, I have used these grips and they have lasted several years of trail riding use. Being dual compound they are both durable and comfortable. They don’t have any raised pattern like the half waffle or pillow top, so they are a nice thin grip for riders who have smaller hands, or just like thinner grips. If your main concern is protection against vibration and arm pump, then these are probably not your best choice, but if you are looking for a durable thin grip, they are worth considering. They have safety wiring channels for those who like to wire their grips on. 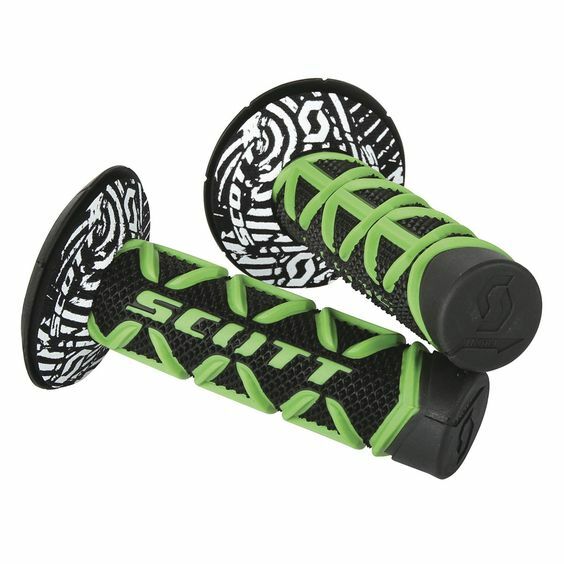 The Scott Sports MX2 Grips are a soft compound and half waffle grip. 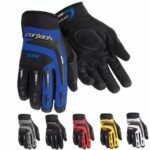 This means they give excellent grip and feel very comfortable when riding. The slimness of these grips may be a problem for some riders because it makes them harder to fit, but if you use some sort of glue or lubricant it makes fitting easier. If you are looking for a soft compound grip and like a thinner diameter, then these may be for you. 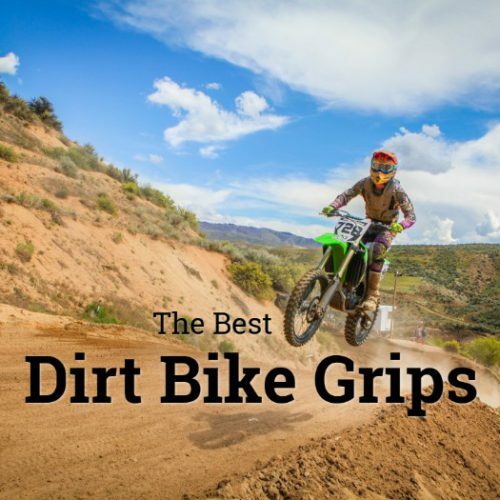 There is no clear winner for the Best Dirt Bike Grips. It is such a personal preference thing that what is right for one person is wrong for another. I’ve given you a broad overview of each of the types available: Firm, Medium, Soft, Multi-Density – Waffle, Diamond, Pillow Top. It all depends on the type of riding you do: MX, Enduro, Trials, Trail – and your own personal comfort requirements. If you’re buying your first set of grips and have no idea where to start, the Scott Sports Radial Half Waffle grips are a popular middle of the range choice, then refine your choice from there. You know you have the right grips for you when you aren’t even conscious of your grips when riding – it means they’re doing their job well. What are your favorite grips? Are there any that should be on this list? Please feel free to share your experiences below. This info is so in-depth, thank you! You clearly know a lot about dirt bike grips, and the fact that you even have the installation tips helps so much. What grips do you personally have? Hi Kely. I personally ride a KTM so I am using the grips that came on the bike. They are a dual compound grip and have lasted years, so I am due for a replacement. I am considering a set of Lock-on grips next so I don’t have to bother with glue and safety wire. Thanks for your comments. Hi Brandon. 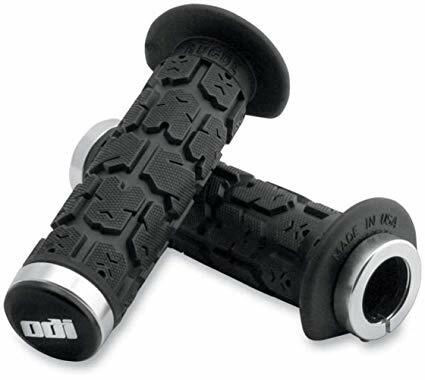 I haven’t used the ODI Rogue Lock-on grips personally, but ODI are the best brand if you want Lock-on grips and from the 111 reviews on Amazon, 83% 5 star, they are very popular. The large surface pattern is very durable and good for vibration resistance, but is suited to riders with large hands. It also depends on the type of riding you’ll be doing. If I can be of any more help, please let me know. Nice post, Almost all the grips has amazing qualities, like you stated,selection of grips is all about choice and preference .For a begginer how can a biker manage vibrations that comes with some grips while on motion? And is it advisable to change grips often and often or there should be reasonable interval in between? Hi Clement. The best grips for reducing vibration are the Pro Taper Pillow Tops (No. 3) or use a soft compound grip if they are too thick for you. How long they last depends on your riding type. Motocross riders will be lucky to get a season out of them. Dual Sport or trail riders may get a few years. If they are rotating on the bars, or worn down and losing grip, its time to replace them.